We all know that sprouts are healthy. This article will help you understand the different types of Sprouts and their amazing health benefits. Sprouts are small in appearance, but are big in nutritional outcomes. They are the “seeds” of life that contain life’s vitality trapped in them. They are “life” in miniature forms and have the potential to create and support life. Sprouts can be used creatively in many forms. Some types of sprouts can be used as a salad that goes well with your hard drink and some types of sprouts can be used as a weight-loss food that helps you fulfill your weight-loss commitment. Bengal Gram: Also known as chola or kala chana, Bengal gram is available in dried as well as canned form. It is frequently and creatively used in various curries in the Indian cuisine and notably, it contains zero percent alcohol. One cup of Bengal Gram contains 45 grams of carbohydrates that constitute about 65 percent of its total calorie content. It has a high amount of dietary fiber which reduces the risk of diabetes, coronary disease, obesity, cancer, and digestive disorders. It is a rich source of vitamin B-6 or Thiamin which plays a vital role in energy metabolism and the synthesis of neurotransmitters and hormones. It is rich in minerals, such as phosphorus, iron, manganese, and copper, which reduce the risk of anemia, arthritis, diabetes, and osteoporosis. An adult who takes a 2000-calorie diet needs 56 to 77 grams of protein daily and Bengal Gram can supply the required amount of protein to him/ her satisfactorily. Green Gram: Also called “Mung”, these species belong to the legume family and is mainly grown in India, South East Asia, and China. It is used in both spicy and sweet recipes. These sprouts have high amount of iron, fiber, and vitamins K, B, and C.
Vitamin K prevents cardiovascular disease and maintains bone density. The vitamin also regulates bone mineralization and the process of blood clotting. Vitamin C is an antioxidant which preserves cell health by neutralizing the effect of free radicals. Vitamin C promotes skin health and reduces the risk of stroke, cancer, and common cold. Iron promotes immune health by promoting the growth of immune cells. Dietary science suggests that men should consume 8 milligrams of iron on a daily basis while women need 18 milligrams of iron to maintain a healthy red blood cell count. Green gram supplies adequate iron that helps to fulfill men’s and women’s dietary needs. Bean sprouts: Bean sprouts are rich sources if vitamin C, proteins, and folate, and most importantly, they are low-calorie foods. Medical research suggests that men must consume 90 milligrams of vitamin C and women should consume 75 milligrams of the vitamin on a daily basis. Folate promotes the development of red blood cells. Folate also supports other functions such as DNA synthesis, cell repair, cell maintenance, amino acid metabolism and the creation of erythrocytes and leukocytes. Folate also reduces the risk of obesity, heart disease, and various types of cancers including colon cancer. Alfalfa sprouts: Alfalfa sprouts are rich sources of vitamins C, K, and A, folate, and minerals such as calcium, magnesium, and iron. Alfalfa sprouts are rich sources of calcium and potassium which promote bone growth and muscle health and help the body to maintain a normal heart beat. Alfalfa sprouts have high amounts of phytoestrogens which reduce the risk of heart disease, osteoporosis, and cancer. Alfalfa sprouts contain saponins which reduce the level of LDL cholesterol (bad cholesterol) and boosts immune strength. The vitamins, present in alfalfa sprouts, promote good vision and cell growth. 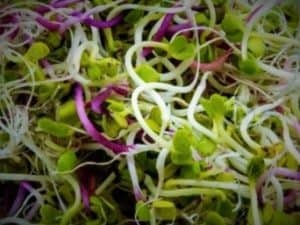 Sunflower sprouts: Sunflower sees have now gained visibility in the health world due to its essential fatty acids , vitamins and mineral content. It is widely used as a snack by weight watchers. Sunflower sprouts contain high amount of essential amino acids which promote muscle tissue repair. Sunflower sprouts are rich sources of B vitamins and vitamins D and E, minerals and phytonutrients, and folate which promote the health of pregnant women and their growing embryos. Sunflower sprouts are packed with antioxidants that support heart health, promote cellular recovery, and bring down the rate of the aging process. What is more appealing is that sunflower sprouts have very low calorie content and that is why, they can be a vital part of a weight loss diet. Sunflower sprouts contain minerals, such as calcium, magnesium, phosphorus, potassium, iron, and copper which help the body to fight against a number of diseases. Radish Sprouts: These sprouts are noted for their high essential amino acid content and they are rich sources of vitamins A, B, C, E, and K as well. Radish sprouts contain lignan which is an anti-carcinogenic substance. Radish sprouts support weight loss and boost the health of the immune system. They also promote the functions of the liver and the gall bladder. Radish Sprouts provide relief to those who are suffering from jaundice by eliminating excess bilirubin from the blood. Radish Sprouts also help to reduce the pain associated with constipation. Radish Sprouts have a special role to play on women’s health as they relieve hot flushes and other menopause-related symptoms. 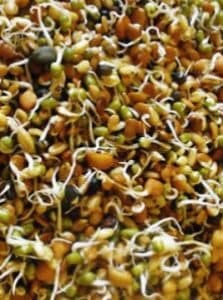 Red Lentil sprouts (masoor): Red lentil sprouts are rich sources of protein and have a low calorie content compared to non-vegetarian sources of proteins such as meat and poultry. Hence, they form an essential part of a weight-watcher’s diet. They contain high amounts of vitamin C, folate, and potassium. Vitamin C protects skin from pre-mature aging and reduces the risk of cancer, stroke, and common cold. Folate supports red blood cell development and supports many bodily functions such as cell repair and maintenance, amino acid metabolism, DNA synthesis, and the development of leukocytes and erythrocytes. 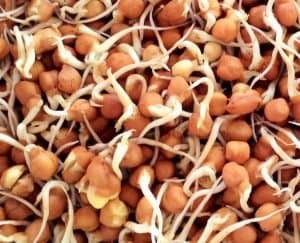 Chickpea sprouts: Also known as “chana” in India, chickpea sprouts are rich sources of protein, vitamins, minerals, dietary fiber, and carbohydrates. Dietary fiber promotes digestive health and reduces the risk of cardiovascular disease and constipation. Chickpea sprouts form a great weight loss food for their high protein percentage and low fat content. They supply a high amount of vitamins and minerals to the body. You can enjoy sprouts either in raw or lightly-cooked form. However, sprouts can lead to food poisoning due to the presence of bacteria, such as Salmonella and E.Coli, which grow in warm and humid conditions. Sprouts related food poisoning is characterized by symptoms such as fever, diarrhea, and abdominal cramps. There is no proper plant treatment that ensures the complete elimination of these bacteria. The only safest way to consume sprouts is to cook them properly. And this especially applies to high-risk individuals such as pregnant women, elderly individuals, children, and people with weakened immune systems. Buy sprouts that have been kept refrigerated. No matter which types of sprouts you use , They should not have a slimy appearance or a musty smell. Check properly. Store your sprouts in your refrigerator at or below 40° F. Wash raw sprouts thoroughly under running water. Boil them properly in case you want to consume them as part of a salad recipe. Else, you may also choose to use them in soups, stir fries, or stews as a taste enhancer. You may also have them baked or roasted form. Now that you know about different types of sprouts and their amazing Health benefits , do include them in your daily diet and enjoy them. Please let me know about ur monthly based fees. thanks for ypur kind words 🙂 . After knowing the benefits of green gram sprout… I intend using it once in a while for BALU…. As a side dish for chappathy…. Can I. ? thanks ya … you can use it for balu just before his dialysis , as green gram will also leave protein residue and can increase his creat . hi, me weight 75 kg, height 5.1.
i have thyroid… morning drink tablet. never diet good. home like food only. daily morning breakfast eat Sprouts Green Gram?? good or bad? eat raw sprouts or boiled sprouts??? its good . for breakfast you can have raw sprouts if it suits your system . daily evening me hungry… all cream biscuits 4, coffee 1 cup, sweet. how is eat sprouts?? raw or boild cook?? how much morning walking ?? and evening?? can like evening simple exercises 10mins?? Hlo Mam ,I m sachin ,I m 17 year old.my weight is 68 kg I want to make six packs abs so plz tell me the Indian diet which is high in proteins and low in fats. Am from Kerala.my current WT is 79kg ht155.i would like to lose 4 kgs per month.am 29 now.goingto gym and doing workouts daily.pls suggest a Kerala diet plan for me .I prefer to exclude rice and its products from my meal plan.pls help me mam.regards. It actually depend on a lot of factors … what is your age ? do you have any hormonal issues ? Are your periods regular ? If at all you have pcos / pcod , then you are bound to get pimples due to unhealthy eating and lifestyle more prominently than a normal individual . hence a good skin care routine , clean eating and drinking plentyyyyy of water is the only way out .. I want to lose my tummy fat how can I ?? 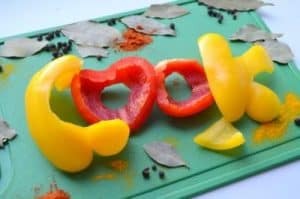 https://www.dietburrp.com/how-to-lose-tummy-fat/ check this article .